In the traditional farming method when the harvest season comes, a farmer hires more people to reap the crops. He will spend a lot of time monitoring the weather forecast, updating records for planning and reporting, and working with agriculture experts, accountants, and business consultants to manage his farm. The methods are costly and took too much time. And nowdays, there is the best solution which is a more effective and less costly method to manage and monitor his farm, namely smart agriculture projects. Apply the best farming practices provided by Professional Agronomist. Support Crop, Livestock and Fishery farming in greenhouses and fields. Collect and process data from sensors and devices. Support online camera views and records. Generate automatically season production activities from defined production process. Trigger thresholds to control the environment conditions from the collected data of sensors. Send SMS and email alerts immediately when system has any error. Provide a community for users such as farmers, suppliers, agronomists and buyers to exchange and share market information and experience. Analyze production operations, processes, recipes, sensor logs, and then give recommendations. Predict and forecast agriculture market demands. Big Data, and Cloud computing technologies as well as use low power consumption sensor devices. Smart Agriculture supports production in both greenhouses and in fields. Each sensor node measures various data such as temperature, humidity, moisture, light and constituents of the soil, then transfers the data to the server on the cloud. Farmers can browse the data accumulated on the server in real-time using their computer, tablet or smart-phone. Smart farming application is designed with a user-friendly interface. You can easily use the software without any frustration. Multi-language is also supported. It provides specialized services not only for Crop Farming Management, but also for Livestock and Fishery Farming. 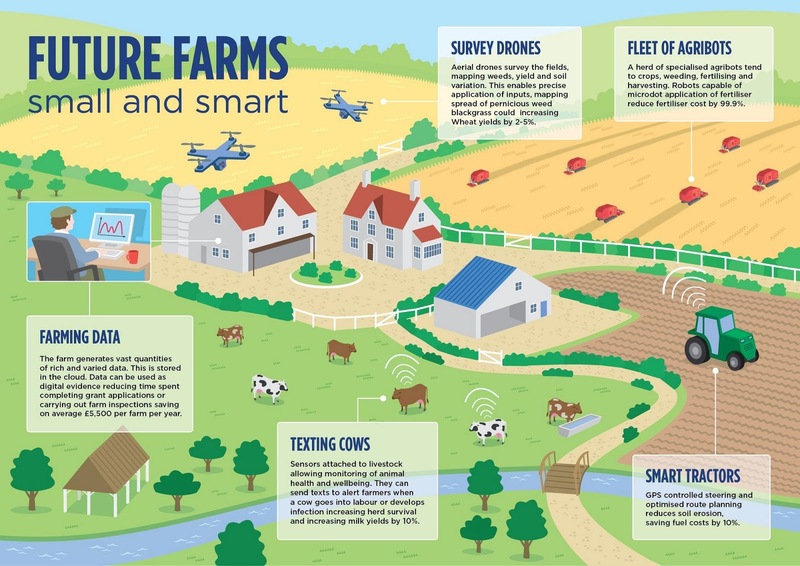 There are many future smart farming projects. Here we provide infographic designed to easy understanding about future farms by using IoT. Farmers can create a production season with a few clicks in Smart Agriculture. It also provides an overview of a 7-day weather forecast. Farmers can take necessary actions to minimize the risk of any unexpected weather change. Users can see executed activities in the Diary area on Production Monitoring screen. The production activity schedule is automatically generated and executed by the system which is based on the defined production process, but it also can be manually executed by hitting the manual button. The Notification area contains all the unexpected events in the system, users will be notified via email or SMS, so that they can immediately take action to fix any issue. You can see the real-time data of the environment in the Production Control Panel, Control the camera, Manual activate the devices, and with the environment data visualization. You can easily keep track of changes for each environment indicator by time. The system supports auto generation of QR codes which contain all information of the product, such as planting date, harvest date, fertilizer used. It will help for product traceability management. All operational activities, nutrients, fertilizer used, and quantities. During season production are recorded and can be accessed easily. Each user has a different access permissions based on predefined user groups that provide multi-tenancy and role-based management functions. Users can see only the defined information to enhance the security level of your system. Smart Agriculture provides agriculture news and a forum for farmers to update and exchange the market information and to share their experiences. 0 Response to "The Future of Smart Agriculture Projects"